Hey fellow writers! I'm back from Florida and had a wonderful time at the Readers' Favorite Award Ceremony in Miami. Last week, I wrote about how I'm a pantser with a plan and also gave tips on what to do if you get blocked. Hopefully everyone is steaming toward the goal line for a 2015 NaNoWriMo win! Today, I'll give you my secret on how I went from writing and publishing two full length novels a year to the range of 10-12. It worked for me to "break the rules." That's it. I revise and edit while writing the first draft. This is supposedly a big "no-no" because conventional wisdom says that you can't create and edit at the same time, that your right brain (the creative one) has to be given full rein to explore and dazzle and flitter and dance, unhampered by the critical editor brain (left brain). I agree, to some extent, but isn't it better to use both sides of your brain at the same time? By revising and editing as I go, I'm more efficient. I can let my right brain take off and create, but every day, I review what I did and my left brain figures out if I'm following my plan, or if I'm breaking my plan, I have a chance to remap my direction. If I realize I went the wrong way, I can backtrack easily while my memory is still fresh and go back and fix the work that went before. I don't delete as many words because I don't write all the way through, especially if I've decided to change the story. Since I fix while I write, I don't have a big tangled mess of a first draft and this means fewer revision and editing passes. So, that's my big secret, and the bonus is that I work longer hours with this method because if my right brain is tired, my left brain takes over. When my left brain retires, my right brain swooshes off on another tangent. It's great, and I recommend you try this to increase your productivity because truly, you are now working twice as hard by putting both sides of your brain to work. Finally, I'm a social writer and love to share. The last way of improving my productivity is to chat and share with other writers and readers. 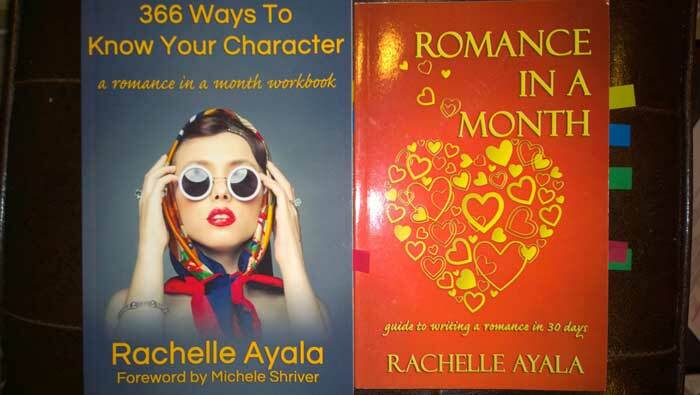 My Romance In A Month Facebook Group practices the principles I describe in my Romance In A Month textbook and the 366 Ways to Know Your Character workbook. I write faster and better when other people are watching. It's because I love the reward of having someone read or comment on my story. 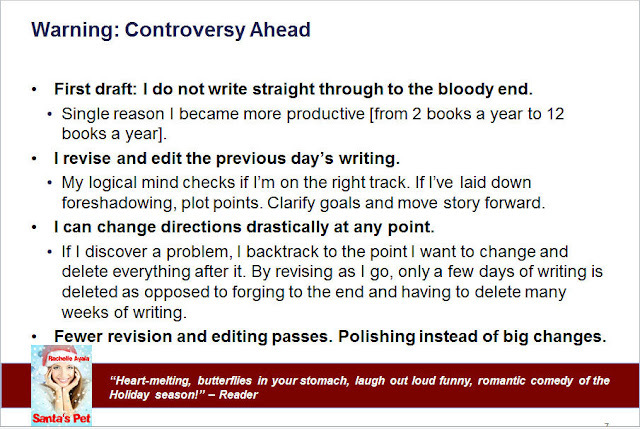 The way it works at Romance In A Month, if you don't write, you don't get to update your thread, so if you want something to talk about, you have to write. I also have a Readers Club where I share excerpts and we chat about things. It makes writing a spectator sport because I get their reactions to my story while I'm writing it. All the social interaction gets people involved with the story and immerses me into the lives of my characters as I'm answering questions about them, or posting answers about what they would do in this or that situation. It really helps me to know my characters if I'm going to be gossiping about them! 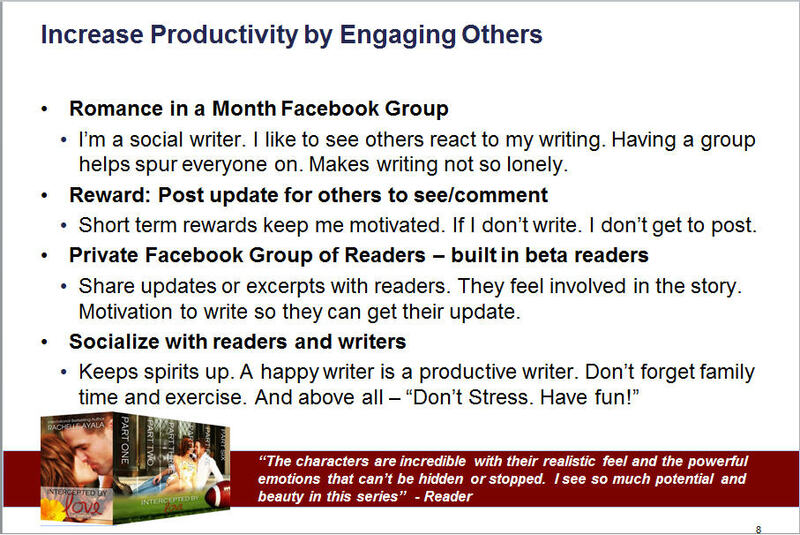 Many thanks to Jade Kerrion and the Florida Writers Association for having me on the panel of the Maximizing Writer Productivity Webinar. 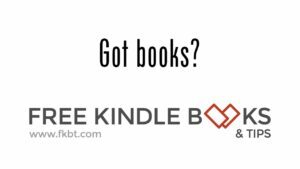 Join my Private Readers Club to keep up to date with me and my writing!